This book analyzes political speeches, but more from a speechmaking perspective than a political perspective. 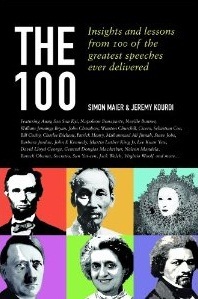 It's about the 100 greatest speeches of history, which were mostly delivered by politicians or political activists. But the book's focus is on how rhetorical techniques accomplished the speaking goals, not on any political goals. The book's focus is on rhetorical devices used by the speechmakers to make their point effectively. Evidently there are terms for these rhetorical devices (pp. 6-7), such as "parallelism" for JFK's trick of using successive phrases with similar grammatical structure: "We shall pay any price, bear any burden, meet any hardship, support any friend, oppose any foe...." Most readers could figure out the term "parallelism," but how about "anastrophe", when a speaker "departs from the normal word order for the sake of emphasis", such as Winston Churchill's famous line, "Never was so much owed by so many to so few." How about "symploce", which apparently is as commonplace as it is unpronounceable (it means repeating a phrase): " Much of what I say might sound bitter, but it's the truth. Much of what I say might sound like it's stirring up trouble, but it's the truth. Much of what I say might sound like it is hate, but it's the truth." That's Malcolm X, and the book offers other examples from JFK to Bill Clinton. My favorite rhetorical device evidently does not have a cool name, but is called only "the rule of three" (p. 6), that "speakers have always found that by putting things together in threes they can hit home with their message." For example, Pres. Obama described his wife as "The rock of our family, the love of my life, the nation's next first lady." When my brother Dan wrote a book and several times used just two terms to make his point, I noted in the margin, "Complete the triptych!" meaning he should add a third term to make the point more memorably. Our mom, an artist, painted a "triptych", or a three-panel painting; my brother, unaware of this term, wrote back, "what the heck are you talking about?" I knew the rhetorical device, and hoped this book might finally justify my using the term "triptych" to parallel "anastrophe" and "symploce", but alas, this one is only "the rule of three." Ronald Reagan: Inherited tired & cynical country; left it encouraged. John McCain: 2008 concession: Obama helps country heal racial wounds. Lyndon Johnson: Malcolm X: LBJ had no "genuine interest" in blacks pre-1964. Barack Obama: OpEd: Life story gives him broad appeal beyond USA. George Bush Sr.: 1989: A new breeze is blowing in world refreshed by freedom. John F. Kennedy: We can work with Communists? Let them come to Berlin! John F. Kennedy: 1963: Support the beleaguered people of Berlin. Ronald Reagan: 1988: Agreed to mutual nuclear reduction with USSR. Rudy Giuliani: Countries must all stand together in fight against terrorism. John F. Kennedy: Bay of Pigs defeat enhanced Castro's stature. John F. Kennedy: Ask not what your country can do for you. Bill Clinton: Stand up and talk about fear and hatred. Rudy Giuliani: America's Mayor: mouthpiece for how Americans felt post-9/11. Colin Powell: Hispanic immigrant today as precious as Mayflower descendant. Barack Obama: Campaign slogan: "Yes, we can". Bill Clinton: Founders knew that America, to endure, would have to change. Bill Clinton: Greatest legacy: set standard for connecting with electorate. John F. Kennedy: Legacy is aspiration, not legislative accomplishments. John F. Kennedy: 1960: Understood the relatively new media of television. Ronald Reagan: 1986: Postponed state-of-the-union for Challenger disaster. John F. Kennedy: 1962: We choose to go to the moon because doing it is hard. Colin Powell: OpEd: will be remembered for speech to UN on WMD in Iraq. George Bush Sr.: 1992 warning on Kuwait from Thatcher: "Don't go wobbly". Barack Obama: Belief that "I am my brother's keeper" makes America work. by Simon Maier and Jeremy Kourdi.